Full’s original sun tracker worked passively and requiring no electricity. The solar panel track was made of bamboo and metal coils that expand and contract automatically with the sun. It needs less maintenance than existing systems, only about once a year. 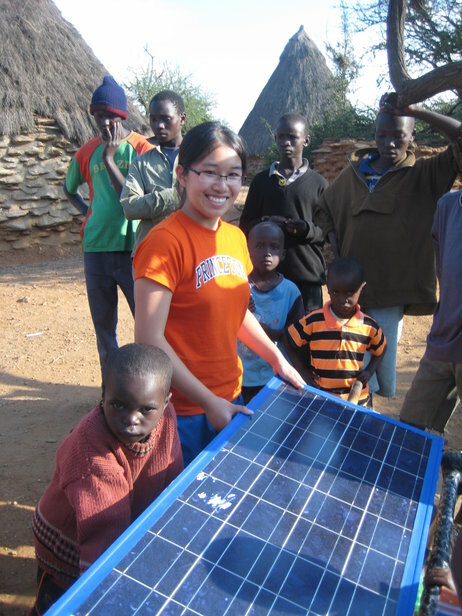 After winning the Theil Fellowship, she was able to add on the clean water component to help fix two problems that affect thousands of people in less developed, rural areas. The new design requires four liters of water connected to a drip mechanism with a counterweight on the other side of the solar panel. After adjusting the flow rate, the water will slowly be filtered and allow the solar panel to track the sun, increasing electricity output by 40%. At the end of the day, there is an additional 4 liters of clean drinking water. Many families cannot prioritize water purification for economical reasons, but with electricity coming from the solar panel, they can afford the filter for the device and have both electricity and filtered water. The technology is simple and requires low maintenance. “We want people to be able to maintain it themselves without having technical knowledge. The reason a lot of these kinds of technologies fail in the field is that they are simply too complicated. We want something that’s really intuitive and easy to understand,” Full says. Full is not the only Thiel fellow working on energy sustainability. In 2009, Jim Danielson and a friend turned a 1987 Porsche 924S into an electric car. During his fellowship, Danielson worked with mentors in the electric vehicle industry and had access to technology, labs and professionals that were not available at his college. His goal is to create an electric motor for electric vehicles that is more efficient and cheaper to produce than current models. Full has since returned to Princeton University and Danielson has returned to Purdue. These students and others are creating technology and products which, if streamlined, can help reduce greenhouse gas emissions around the world. Not all projects need to be for the corporate world, individual actions can also make an impact.